Meg and Zac are bad kitties! Yup, they made certain that I was awake at 4:30 this morning. I did, however, manage to sleep until 6. Luke and I went for a long walk, and I was at the box before 8. Coach Deborah was kind enough to lead today’s 8:30 am session so that I could work out with my peeps. I completed rounds @ 35, 36, 37, 37.5, 38, 38.5, 39, and 39.5″. I attempted a round @ 40″, but was unable to jump that damned high. This was the first time that I was able to successfully complete a 39.5″ box jump, and I did so about 6 times. Yay! A PR! My goal, as always, was to complete all rounds unbroken. I knew the dead-lifts wouldn’t be a challenge, thought the planks holds would be less of a challenge than they turned out to be, and thought it highly unlikely that I’d be able to complete all rounds of double unders unbroken. I was surprised — and surprised myself — with how the workout transpired. Ten dead-lifts with no challenge, although I wasn’t the first to complete the reps. Uhm, that’d be Felicia and Angelina, two very strong lifters. The first plank hold was easy. I began double under facing Thom, and his rhythm, or lack thereof, threw me off. I failed on the 6th rep. I turned my back to him and easily completed 20 unbroken reps. Eight dead-lifts, 1-minute plank, 40 unbroken double unders. The easiest round. Six dead-lifts and than a somewhat challenging 1-minute plank hold. My arms were shaking. In addition, Luke had taken over my yoga mat. Bad kitties! I began to think that I might not be able to complete all five 1-minute plank holds without having to rest while doing so. 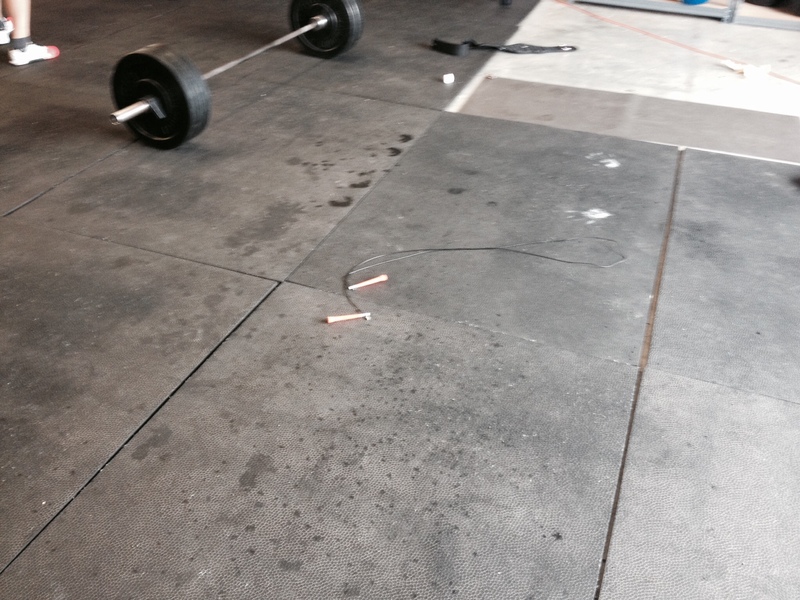 Completing 60 unbroken double unders boosted my confidence. Four dead-lifts, a 1-minute plank, and then 80 double unders in reps of 27 and 53. Dammit. My right foot got caught in the rope. Dammit. Two dead-lifts, one last 1-minute plank with very shaky arms, and 100 double unders. For a moment I was convinced that I could complete 100 unbroken reps. Unfortunately, I was sweating so profusely that the handles slipped out of my hands after 75 reps. I paused a brief moment and completed the last 25 reps.
‹ PreviousRunning. That is not all.